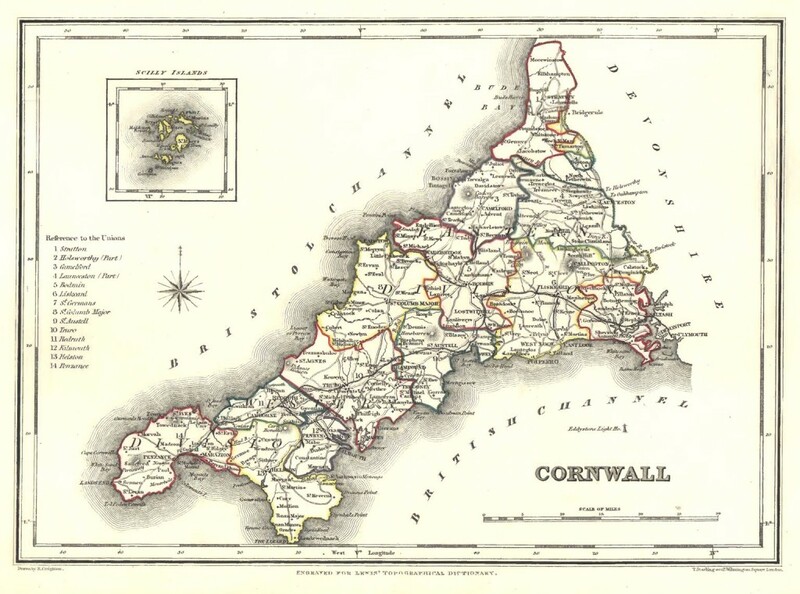 Cornwall forms the westernmost part of the south-west peninsula of the island of Great Britain, and a large part of the Cornubian batholith is within Cornwall. This area was first inhabited in the Palaeolithic and Mesolithic periods. It continued to be occupied by Neolithic and then Bronze Age peoples, and later (in the Iron Age) by Brythons with distinctive cultural relations to neighbouring Wales and Brittany. There is little evidence that Roman rule was effective west of Exeter and few Roman remains have been found. Cornwall was the home of a division of the Dumnonii tribe – whose tribal centre was in the modern county of Devon – known as the Cornovii, separated from the Brythons of Wales after the Battle of Deorham, often coming into conflict with the expanding English kingdom of Wessex before King Athelstan in AD 936 set the boundary between English and Cornish at the high water mark of the eastern bank of the River Tamar. From the early Middle Ages, British language and culture was apparently shared by Brythons trading across both sides of the Channel, evidenced by the corresponding high medieval Breton kingdoms of Domnonée and Cornouaille and the Celtic Christianity common to both territories. The north and south coasts have different characteristics. The north coast on the Celtic Sea, part of the Atlantic Ocean, is more exposed and therefore has a wilder nature. The prosaically named High Cliff, between Boscastle and St Gennys, is the highest sheer-drop cliff in Cornwall at 223 metres (732 ft). However, there are also many extensive stretches of fine golden sand which form the beaches that are so important to the tourist industry and the reason many people are moving to Cornwall, such as those at Bude, Polzeath, Watergate Bay, Perranporth, Porthtowan, Fistral Beach, Newquay, St Agnes, St Ives, and on the south coast Gyllyngvase beach in Falmouth and the large beach at Praa Sands further to the south west. There are two river estuaries on the north coast: Hayle Estuary and the estuary of the River Camel, which provides Padstow and Rock with a safe harbour. The seaside town of Newlyn is a popular holiday destination, as it is one of the last remaining traditional Cornish fishing ports, with views reaching over Mount’s Bay. The south coast, dubbed the “Cornish Riviera”, is more sheltered and there are several broad estuaries offering safe anchorages, such as at Falmouth and Fowey. Beaches on the south coast usually consist of coarser sand and shingle, interspersed with rocky sections of wave-cut platform. Also on the south coast, the picturesque fishing village of Polperro, at the mouth of the Pol River, and the fishing port of Looe on the River Looe are both popular with tourists.